James Franklin Bell was born near Shelbyville, Kentucky, on 9 January 1856. He graduated from the United States Military Academy in 1878. He was commissioned a second lieutenant in the 9th Cavalry upon graduation and soon was transferred to the 7th Cavalry. He married Sarah Buford in 1881. The next year, he served with the military escorts for the Northern Pacific Railroad construction crews. Bell taught military science at Southern Illinois University from 1886 to 1899, and while there he studied the law. He was subsequently admitted to the bar. Bell was promoted to first lieutenant in 1890 and then became secretary of the Cavalry and Light Artillery School at Fort Riley, from 1893 to 1894. He served as judge advocate of the Department of the Columbia in 1898 and then assigned to General Wesley Merritt’s Philippine expedition as a major of volunteers. The next year he fought against insurgents in the Philippines and was promoted to captain of the 7th Cavalry in 1899. Later that year, he was made a colonel of the 36th Volunteer Infantry and earned a Medal of Honor for his gallantry in action at Proac, Luzon. 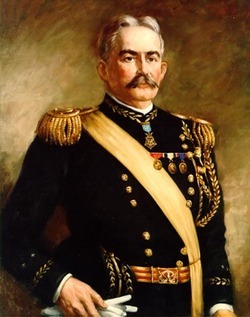 After the Spanish-American War, Bell became a brigadier general in the Regular Army. He then commanded the First District, Department of Luzon before he served as the commandant of the Army Service School at Fort Leavenworth from 1902-1906. In 1907, Bell was promoted to major general. He served as Army Chief of Staff from 14 April 1906 to 21 April 1910. While he was the Chief of Staff, Bell helped prepare legislation which provided for increases in strength, pay, technical services, and reserve forces. He commanded the Army of Cuban Pacification and led the Army’s relief efforts after the San Francisco earthquake. Bell later led the Department of the Philippines, the Western Department, the Eastern Department, and then Camp Upton and the 77th Division during the First World War. He resumed command of the Eastern Department, and he died in New York City, on 8 January 1919.